﻿International Biodiversity Day: Calendar, History, Tweets, Facts, Quotes & Activities. The International Day for Biological Diversity aims to raise awareness and understanding of biological diversity and issues surrounding it. The day also serves to highlight possible strategies to protect biodiversity, which refers to the variety of life on the planet. Today, habitats are degrading and leading to a reduction in biodiversity, a problem that directly affects human well-being, poverty reduction and global sustainable development. 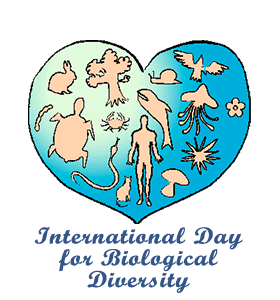 The International Day for Biological Diversity was proclaimed in December of 2000 by the United Nations General Assembly. It is celebrated annually on May 22, a day that commemorates the adoption of the Convention on Biological Diversity in 1992. The 2018 theme for International Day for Biological Diversity is Celebrating 25 Years of Action for Biodiversity. According to the UN, more than 3 billion people depend on marine and coastal biodiversity for their livelihoods and 1.6 billion people rely on forests and non-timber forest products for their livelihoods. Habitat degradation and the loss of biodiversity are currently threatening the livelihood of over 1 billion people who live in dry and subhumid climates. Over 50% of the world’s plant species and 42% of all terrestrial vertebrate species are native to a specific country and do not naturally exist elsewhere. We should preserve every scrap of biodiversity as priceless while we learn to use it and come to understand what it means to humanity. – E. O. Wilson, American biologist, researcher, theorist and author. Watch a movie or documentary on the importance and irreplaceability of the world’s biodiversity. Some suggestions are: The Cove , Oceans , Plastic Planet and the 11th hour . Spread awareness on social media by using the hashtags #InternationalDayForBiologicalDiversity, #IDBD and #BiologicalDiversity. Join the international Day for Biological Diversity Google Hangout where you can video stream yourself and with other people to discuss biological diversity with like-minded individuals. Organize or participate in a local cleanup effort. Biodiversity is very negatively impacted by human trash and pollution. Donate to the center for biological diversity. All funds are put towards securing a future for all species hovering on the brink of extinction with a focus on protecting lands, waters and climate that species need to survive. Consider funds like WWF, the Animal Project and Defenders of Wildlife.